Navarro, I.; Galindo, A.; Fonseca, D.
In the present paper, we describe the methodology for the implementation of Augmented Reality (AR) on a project with high-school students, in order to display content related to the book La reina descalza (Ildefonso Falcones), which was presented at the official launch of the bestseller. The project was developed by a group of students in the Humanities and Technology specialties of the school La Salle Virgen del Mar, Almeria, Spain. The method proposed is based on the recognition of the cover picture of the book, which acts as a mark of AR, allowing for the viewing of a series of digital images that are linked to multimedia content developed by the students. The proposed method is intended as a technologically advanced and entertaining system for use in educational environments that enables the display of information to students in addition to the printed documentation with which they are provided. The main objective of this work is a qualitative assessment of the use and adaptation of RA content in research projects at high school levels for displaying multimedia content. 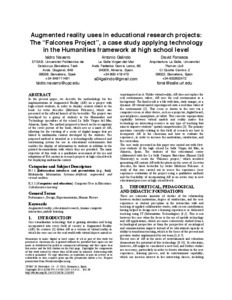 Navarro, I.; Galindo, A.; Fonseca, D. Augmented reality uses in educational research projects: The "Falcones Project", a case study applying technology in the Humanities framework at high school level. A: Technological Ecosystem for Enhancing Multiculturality. "Proceedings of the 1st International Conference on Technological Ecosystem for Enhancing Multiculturality". Salamanca: ACM, 2013, p. 411-415.